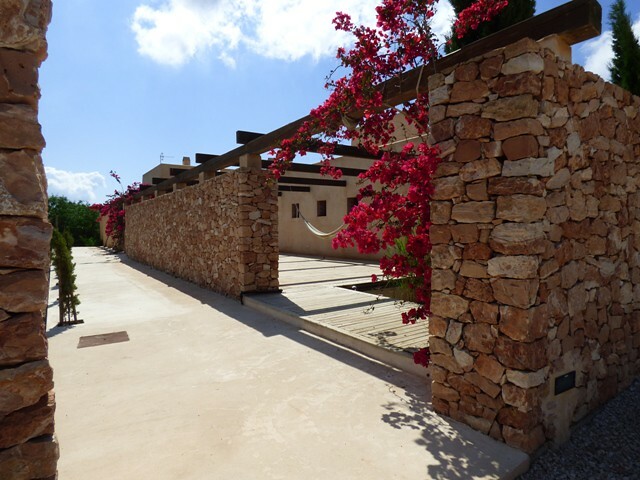 This villa is located in the wonderfully quiet and peaceful countryside of the Cap de Barbaria. The property has an expensive terrace to the front, with wooden lattice beams. Leading to entrance lobby and inner vestibule area of the house. Large living room/ salon with front and rear terraces and open plan kitchen. Bedroom 1) Double bedroom with ensuite, patio doors leading to rear terrace and swimming pool. Bedroom 2) Double bedroom with ensuite, patio doors leading to rear terrace and swimming pool. Bedroom 3) Twin beds with patio doors leading to rear terrace and swimming pool. No ensuite, but very close to one of the main bathrooms. Bedroom 4) Double bedroom with patio doors leading to rear terrace and swimming pool. Jack and Jill door leading to bathroom. Total of 4 bathrooms including 2 ensuite. Large south-facing terrace with al fresco dining table and swimming pool, chill out seating area. The property can sleep up to 10 adults and 2 children. Número de inscripción turistica / Tourist registration number / Numero di registrazione turistica / Tourist-Registrierungsnummer: ET1788 250 € final cleaning.